The First Designs (1¢, 3¢, 5¢, 10¢, 12¢ and 90¢) and First Colors (24¢ and 30¢) were followed by a second set of stamps made from modified dies and plates. The differences between the first and second designs are very noticeable on the 3¢ and 12¢, but more subtle for the other four denominations. The 24¢ Dark Violet and 30¢ Red Orange colors are unlike any of the issued stamps. 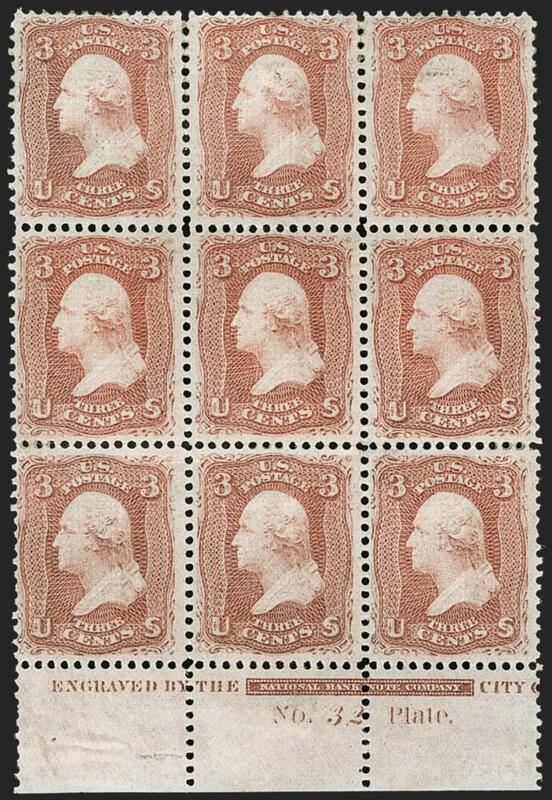 All were printed on a thin semitransparent stamp paper--some were gummed with a dark brownish gum and perforated. Only the 10¢ First Design (also known as Type I) was issued through post offices. The others from the trial printing were distributed through other channels. 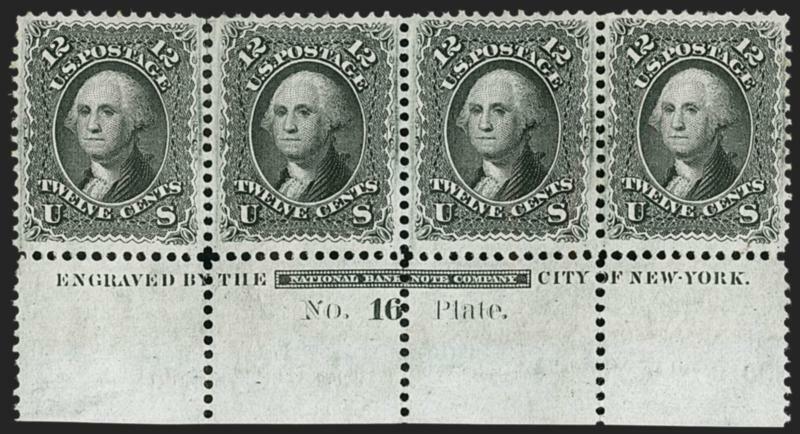 Four plates were made to print 10¢ stamps, each with a plate number. 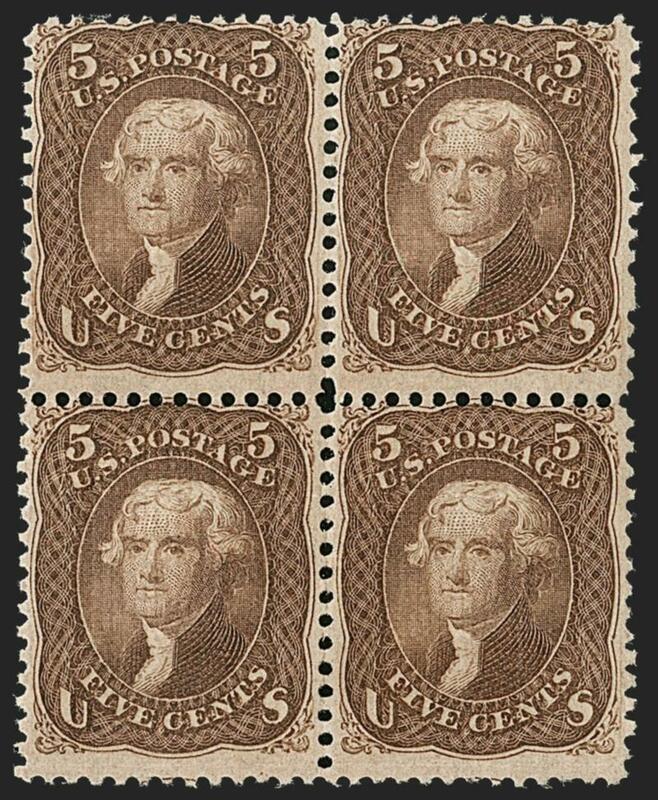 The first, Plate 4, was entered from the First Design die (Type I, Scott 62B)--only one block with a Plate 4 number is recorded (sold in the Gross U.S. Treasures sale). 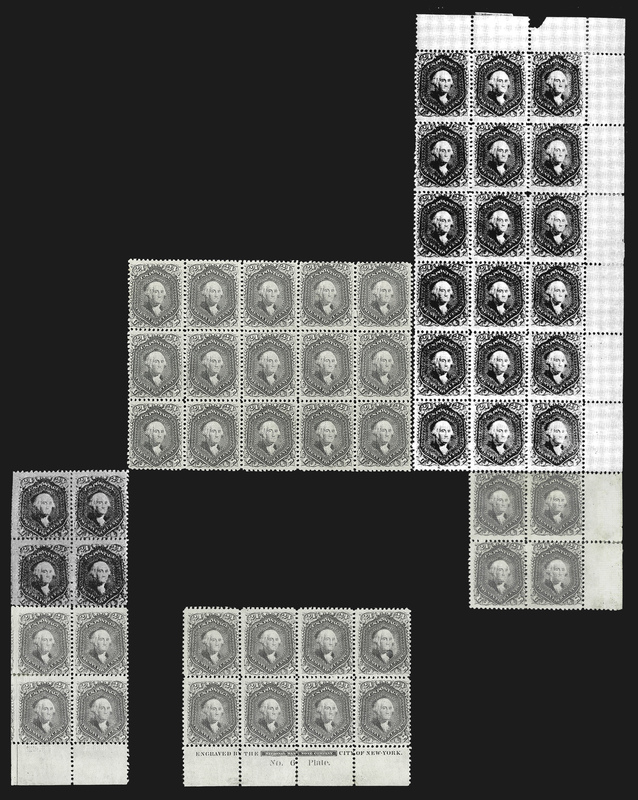 The 1861-68 10¢ Type II stamps, both ungrilled and grilled, were printed from two plates--Plates 15 and 26--but only Plate 15 is represented by stamp multiples with the number. 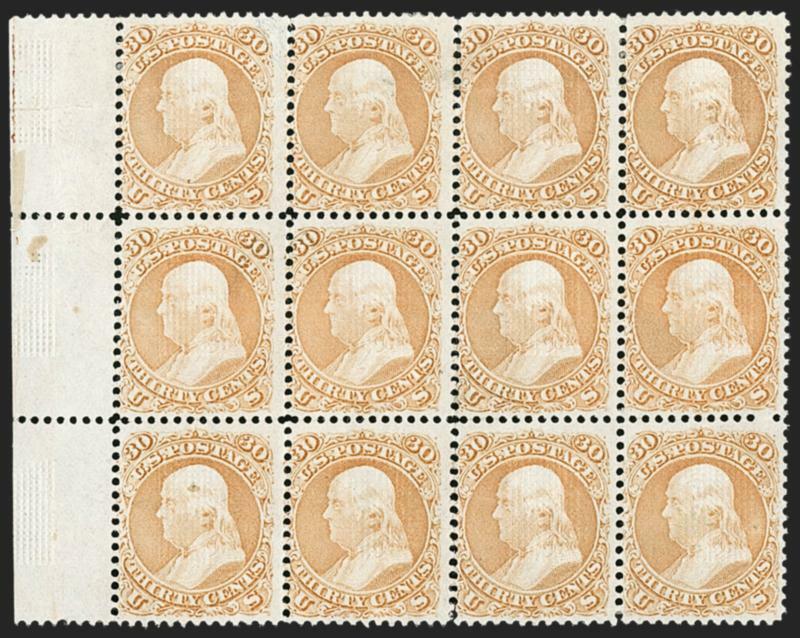 There is the unique plate block of Scott 68 offered in this sale (lot 63) and one plate block with "Specimen" overprint. Plate 59 was made for the 1875 Re-Issue (Scott 106). 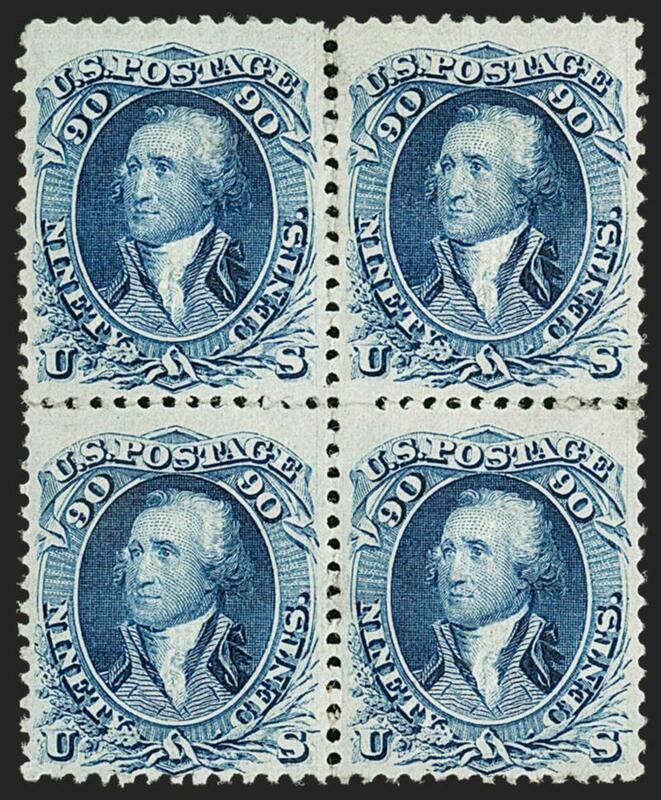 Beginning in January 1868, the 10¢ stamps were grilled, using the machines patented by Charles F. Steel and starting with the Z Grill (Scott 85D), followed by the E and F Grills (Scott 89 and 96). The only known plate number multiple among the three grilled issues is this original-gum strip of four with the full Plate 15 imprint and number. When the National Bank Note Co. won the contract to print stamps, they had already designed the 1861 Issue, engraved the dies and made eight plates for each denomination, and printed sheets of "sample labels" to submit as part of the competitive bidding process. The differences between the 12¢ First and Second Designs are significant. The First Design die was used to make Plate 5, and that plate was only used for the trial printing. 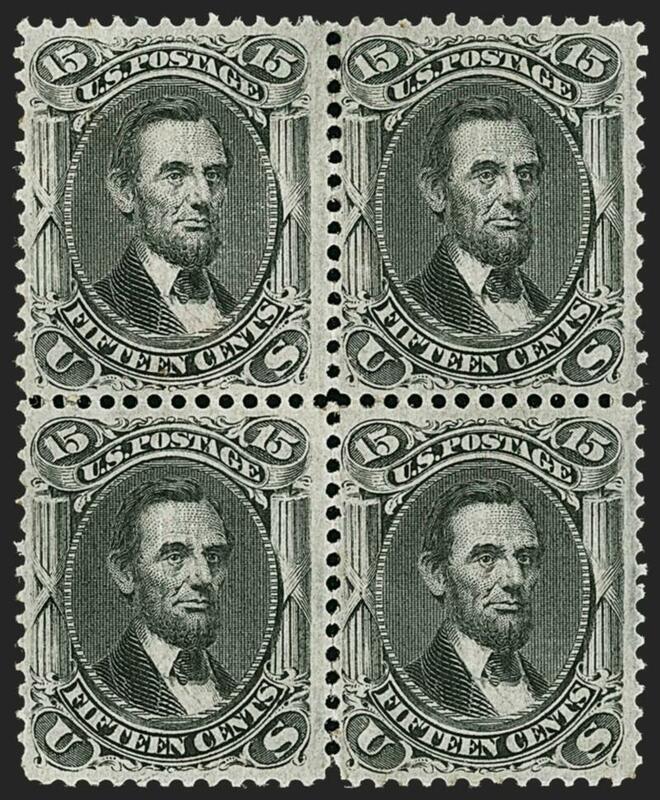 The Second Design stamps issued from 1861 through 1868 were printed from one plate, Plate 16. Another plate, Plate 60, was made for the 1875 Re-Issue (Scott 107). Beginning in January 1868, the 12¢ stamps were grilled, using the machines patented by Charles F. Steel and starting with the Z Grill (Scott 85E), followed by the E and F Grills (Scott 90 and 97). The Chapin no. 251 entry lists a Scott 69 strip of four in the Hind sale (Phillips-Kennett, 11/20/1933, lot 266), but the description for that strip reads "part imprint and plate No., perfs close at bottom." In our opinion, that strip was reduced to the pair listed in Chapin as no. 250 (#2 in the list above). 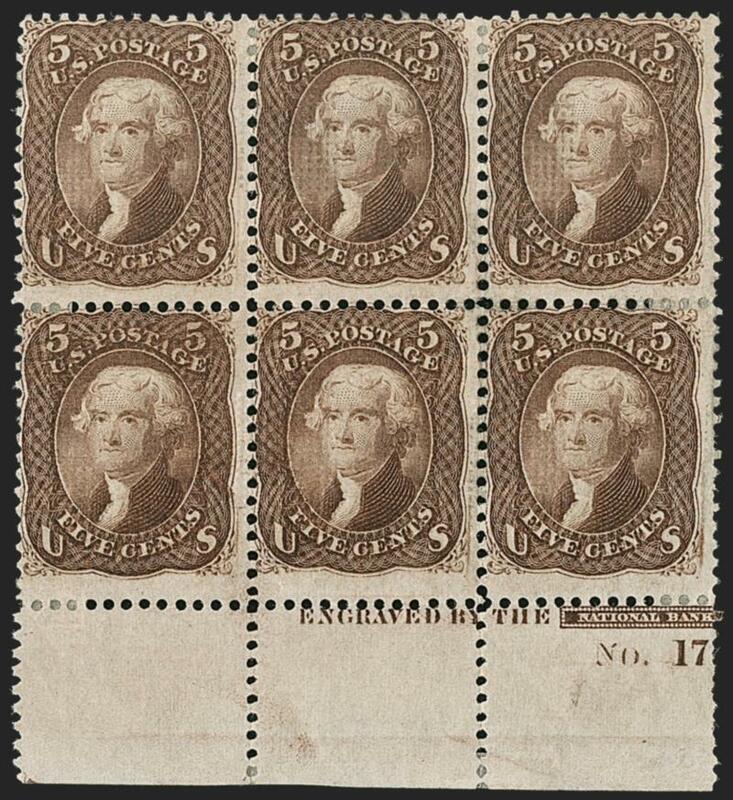 A plate block of eight with "Specimen" overprint was altered prior to 1940 by removing the overprint. According to Ashbrook's indexed notes, it was offered by Klemann to Moody, but Colson determined it had the overprint removed--its current whereabouts is not known. 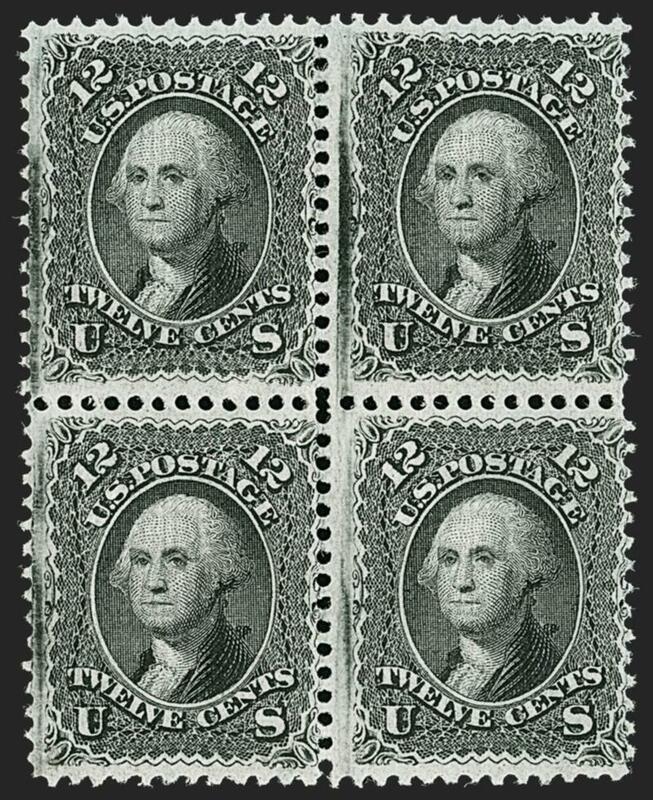 Very Fine-Extremely Fine; a flawless block which we believe contains Mint N.H. stamps (as noted above), but certificate states "previously hinged"
The 24¢ 1861-68 was printed from one plate, Plate 6, which was used for the trial printing in Dark Violet (First Color) and for all subsequent printings. In 1868 a supply of sheets was grilled with the F Grill roller (Scott 99), using the machine patented by Charles F. Steel. This block of 15 and the plate number block of eight sold in the Gross U.S. Treasures sale originated from the same pane of 100, which was sold in one of the early major "name" stamp auctions--the Frederick de Coppet collection--held by J. W. Scott Co. in New York City in April 1893. This auction featured a British Guiana 2¢ Cotton Reel, which sold for $1,000, a record price at the time. Lot 1944 was described as "24¢ VIOLET, entire sheet with perfect margins, original gum, fine in every way, probably unique, 100 (stamps)." The pane was sold for $300. Following the 1893 de Coppet sale, the 24¢ F Grill pane was divided into smaller units. The plate block and a few other blocks were acquired by the Cleveland tycoon George H. Worthington, and the block of 15 became part of automobile magnate Joseph T. Lozier's collection. A large block of 18 from the upper right corner eventually found a place in Colonel Edward H. R. Green's collection. When it was sold in Part 23 of the Green sales (Barr 10/15-18/1945), it was immediately divided into smaller blocks, as documented in a note from Philip H. Ward, Jr., who wrote "[the block] was broken... in New York yesterday so that my Lozier block of 15, which is well centered, is the largest block now known to me" (Ashbrook index files). Digital reconstruction of the de Coppet pane of 100, sold in 1893 and divided into smaller blocks. The block of 15 is shown in its approximate position. The block of 18 at upper right was divided after the Green sale. The 30¢ 1861-68 was printed from one plate, Plate 6, which was used for the trial printing in Red Orange (First Color) and for all subsequent printings. In 1868 a supply of sheets was grilled with the F Grill roller (Scott 100), using the machine patented by Charles F. Steel. Unused blocks of the 30¢ F Grill are extremely rare. In fact, no other intact unused block was found by us after a careful search of auction and certification records. 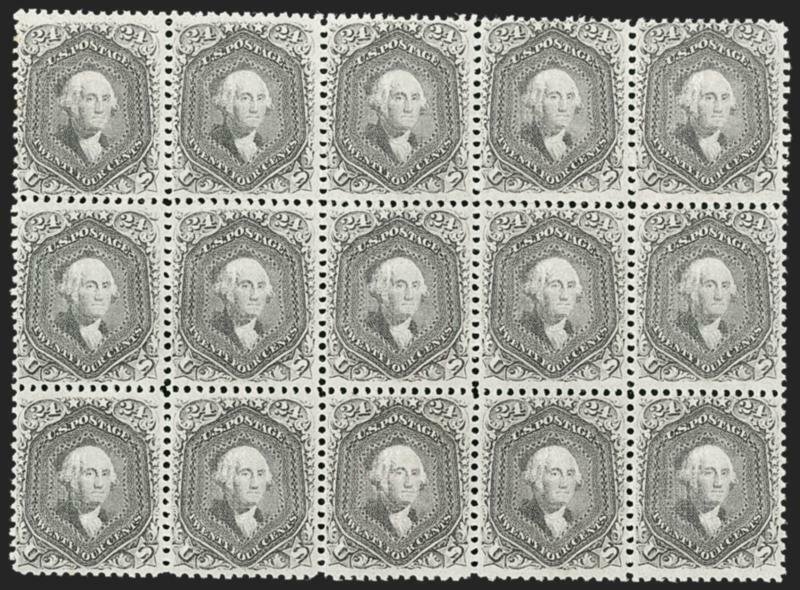 The Philatelic Foundation has certified the left margin block offered here and only one other, the ex-Lilly block of four that was certified as "severed and rejoined." For the first 100 years of their existence, the two blocks in this multiple were joined together. As a block of twelve, it passed from Worthington to Lozier to Sinkler and then to Ward after the 1940 Klein auction of the Sinkler collection. The Weills bought the Ward estate in 1963 and kept the block intact for their principal client, Benjamin D. Phillips, who acquired it in 1964 along with large parts of the Ward collection. The design of the 90¢ 1861 adopted the previous issue's Trumbull portrait of a youthful General Washington in uniform, but added "90" numerals to make the denomination more obvious. The same deep blue color was chosen for the top value, but the perforation gauge was changed from 15 to 12, and the holes were enlarged. Two 90¢ plates were made: Plate 8 from the First Design die, and Plate 18 from the modified die. In 1868 a supply of sheets from Plate 18 was grilled with the F Grill roller (Scott 101), using the machine patented by Charles F. Steel. There are approximately ten original-gum blocks of the 90¢ 1861 without grill, but only two unused F Grill blocks have been documented. Both have original gum, identical centering and shade, and undoubtedly originated from the same area of the same sheet. The ownership history of the two blocks has been confused by the absence of photographs in the 1917 Worthington and 1933 Hind auction catalogues, and by the similar appearance and condition of the blocks. We have concluded that the block offered in this sale, which was definitely Caspary's, probably came from the Worthington collection. The other block, sold most recently in our sale of the Richard Drews collection (Sale 1195, lot 406), is definitely the Sinkler block (Klein sale, 5/17/1940, lot 133), and it was described in that sale as ex Ackerman. In our opinion, the Sinkler block passed from Ackerman to Hind to Lozier and then Sinkler. One compelling piece of evidence supporting this conclusion is a copy of the 1933 Hind catalogue in our library that was Warren H. Colson's personal marked copy. He represented Caspary in that sale and did not buy the block for him, probably because Caspary already owned the Worthington block at that point.